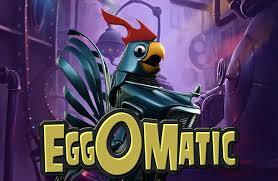 Welcome the Eggomatic factory where the chickens rule the roost in this online 5 reel casino online slots game. Strive to match varying egg combinations to increase your profits and unlock a range of in-game features including free spin bonuses and prize egg cash rewards. Created by the ingenious developers at NetEnt, Eggomatic comes to offer an extravagant slots experience like you’ve never had before, while further establishing the company’s well-earned place in the lead of the digital casino industry. For two decades, NetEnd have been coming up with unique and thrilling slot games, offering you superior graphics and sounds, along with fascinating themes. In Eggomatic, robotic chickens steal the show and take you to their egg factory, with the promise you won’t be bored for a second! Oh, and their eggs happen to be quite valuable, so get eggcited! Sign up to mobile slots and claim your free spins! The theme and story of this slot game are creatively explained in a high quality short animation, designed with a vintage feel. The egg business seems to be decreasing in produce, so a witty robotic Rooster invents the Eggomatic, a high-tech machine that makes eggs in huge amounts. This funny little introduction makes way for the actual game, which is designed with just as much attention to detail, abounding in uniqueness and, most importantly, wins. In Eggomatic, the 5 reels, 3 rows and 20 paylines are set inside the egg factory, right by the ingenious machine and below a conveyor belt that holds the produced eggs. All is designed with impeccable 3D graphics, while a playful soundtrack plays in the background, accompanied by the occasional electrical twitch of the chicks and the mechanical sound of the moving conveyor belt. All these details add up to the authenticity and complexity of the game, and that alone will make you keep playing. But let’s talk about the golden eggs and golden wins. You can bet coins between 0.01 and 1.0, with up to 10 coins per line. The minimum bet per spin is 0.20 and the maximum bet is 200.00. The symbols are various robotic chickens with insides full of gold coins, ready to burst open if spun the right way. You can’t miss the large blue rooster, holding the big “Wild” sign-he’ll become your best friend in Eggomatic; he’s the one that can substitute any other symbol, to grant you winning lines. If there’s a Bonus egg holding Free Spins and Coin Wins on top of the reel where the Wild appears, the egg will activate, as the rooster cracks them open. So the Bonus feature plays constantly in this new casino games, with the eggs progressing on the conveyor belt on each spin. The Spreading Wild egg will turn all adjacent and diagonal symbols into Wilds, the Free Spins egg will activate between 7 and 50 Free Spins, while Coin Win eggs multiply bet levels, helping you hit the egg-pot. For even more excitement, there’s also a Surprise egg, which can contain any of these features. 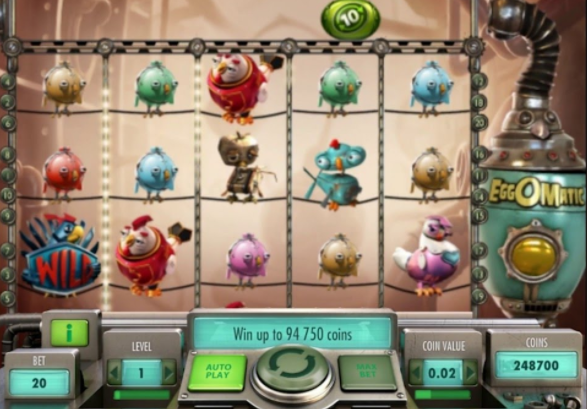 Eggomatic will bring a more than satisfactory slots experience even to the pickiest player, thanks to its originality, flawless graphics and numerous chances of winning. So start playing and crack up some eggs! NetEnt have really outdone themselves on this slots game, combining all the best ingredients and placing them in a beautiful and fun packaging. There’s nothing more exciting than betting and winning in a game that actually looks good, keeps you on the edge of your seat and pleases your eyes. You shouldn’t contain your eggcitement for it! Another buzzing game to try is our Aloha Slots.